"Fashion fades, only style remains the same" - Coco Chanel , the french fashion designer who ruled over Parisian couture for almost six decades. First post for 2010 has to be Coco Chanel. The woman ooz'd class. Her style is as still in demand today as it was decades ago. 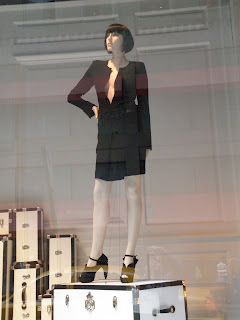 When I was in the city in September, the movie had been playing and Saks windows were a tribute to her. 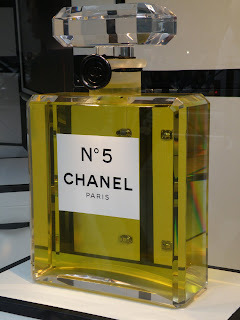 How much do you think for this size of #5 ? Would they take an IOU ? Could you imagine this in your bedroom/bathroom ? It would make all your other bottles look pretty silly quite frankly!! Just amazing stuff ......was great to look at and enjoy! I did not get to see the movie as it didn't play in my hometown however is to be released on DVD February 16th of this wonderful new year. I am looking forward to viewing of the woman who made all the rules on style, fearlessness, success, living life on your own terms and an elegant attitude. Please comment if you did see the film, how you enjoyed it. 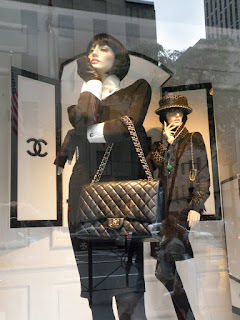 I love Chanel's fall/winter 2009 collection. 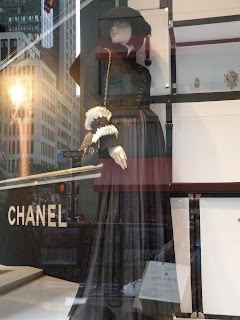 Beautiful window display! I too am a HUGE fan of Coco!!! she was born just a day after my own birthday! she is my idol and inspiration in all I do:) beautiful article and images my Queen!! Thanx for such positive feedback! I am still new to this but feel it will be very exciting!